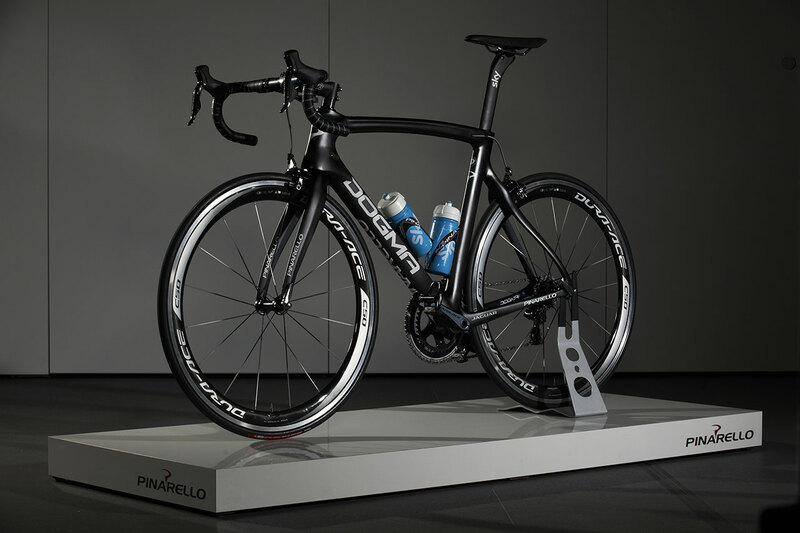 The car maker, renowned for some of the world’s finest luxury saloons and sports cars, has used its advanced aerodynamic knowledge and facilities to help in the creation of the new Pinarello Dogma F8 bicycle, to be raced by Team Sky during the remainder of the 2014 season. 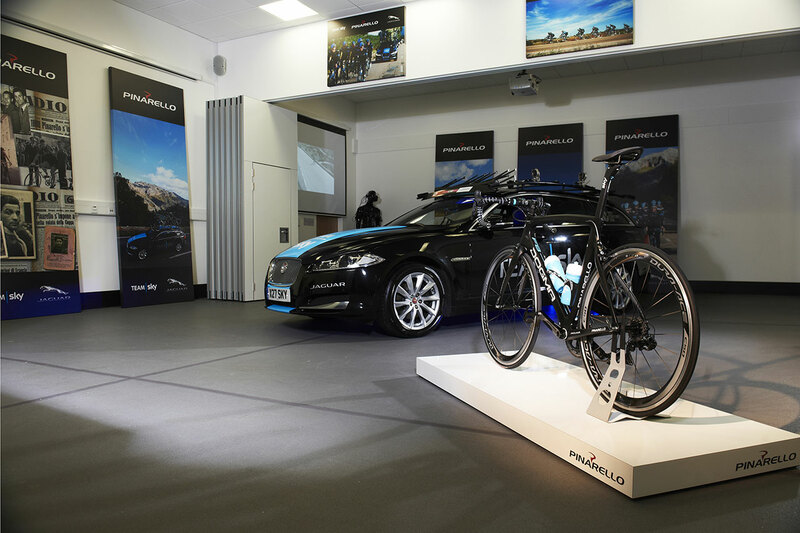 This is the first time Jaguar’s comprehensive technical capability has been used by the team, and marks the beginning of a new collaborative relationship between Jaguar, Team Sky and its family of partners and suppliers, including legendary frame manufacturer Pinarello. Jaguar is now an official ‘innovation partner’ with Team Sky. 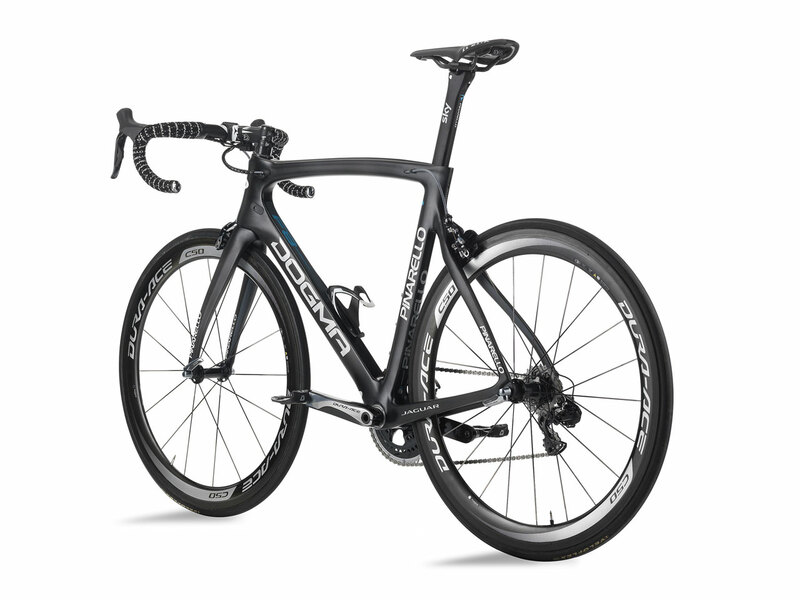 The Dogma F8’s first race will be the Critérium du Dauphiné, which starts on June 8. Its major test this year will be on the Tour de France, which starts in Leeds on July 5. Team Sky and Chris Froome are the defending champions. Team Sky also won in 2012, with Sir Bradley Wiggins. Sir Dave Brailsford, Team Principal of Team Sky, fresh from overseeing Sir Bradley Wiggins’ victory in the Tour of California, says access to Jaguar Land Rover’s technical resources would help Team Sky to be even more competitive in future. Jaguar’s role was to help give Pinarello’s top-end bicycle frame even better aerodynamic performance. Working to fixed ‘hard points’ – such as wheelbase and geometry determined by Pinarello’s designers – Jaguar’s engineers developed the frame to improve the aerodynamics of the tube profiles, and reduced the drag of components mounted to the frame. More than 300 CFD ‘virtual’ runs were done between October and January, using the same methods to optimise the aerodynamics of new Jaguar Land Rover road cars. The drag of every single component was measured, and single modifications could be analysed and compared. Wind tunnel work was then used to verify the CFD tests. Aero-led changes include aerofoil-shaped tubing optimised within UCI regulations, and a new aero seat post. The Dogma F8’s front forks have been developed to minimise drag and ensure seamless airflow on to the down tube. The rear derailleur wire/cable exits the frame at the back of the drop out, again to reduce turbulence. Three holes on the seat tube allow for a lower position for a second drink bottle, to further reduce drag. In certain areas, Jaguar accentuated the famous asymmetric design of the Dogma 65.1 to improve aerodynamic performance. The seat mono stay around the rear brake is now asymmetric to guide airflow cleanly around the brake calliper, while using the minimal amount of material. The upper section of the rear chain stay is also heavily asymmetric. The wind tunnel tests show the new Dogma F8 is 26.1 per cent more aerodynamic (complete bike) than the outgoing Dogma 65.1 and 6.4 per cent more aerodynamic including a rider. The frame set alone is 40% more aerodynamic ally efficient. 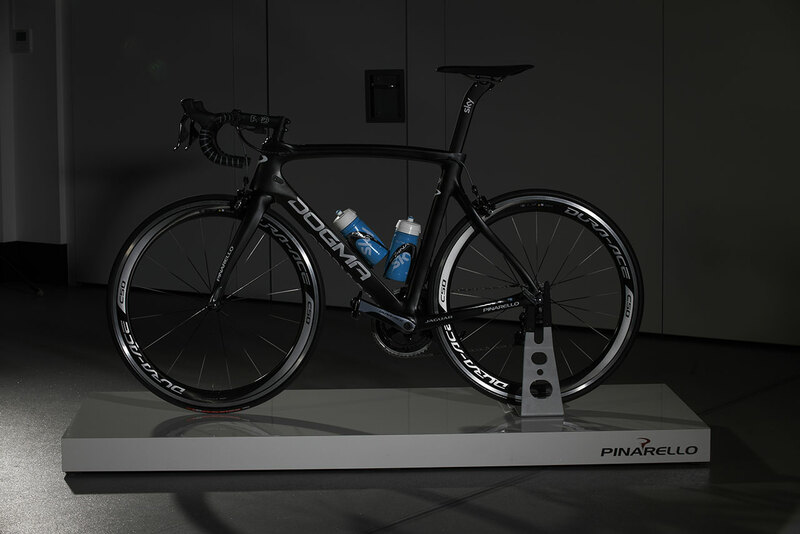 Pinarello’s priorities, for the new Dogma F8, were to maintain handling, reduce weight, and improve the stiffness and aerodynamics. Handling had to be at least as good as the acclaimed Dogma 65.1. Weight should be reduced (it was – by just over nine per cent) and stiffness further improved (achieved partly thanks to an even better grade of Torayca T11001K carbon fibre from supplier Toray). Aerodynamics had the potential for significant improvement. Pinarello CEO Fausto Pinarello insisted the new Dogma F8 must have the legendary Pinarello DNA including the best possible performance. He is confident the new Dogma F8, flagship of the Pinarello range, is the fastest frame Pinarello has ever designed. ‘The best bike in the world, I think, has got even better, and Jaguar helped us to deliver that. 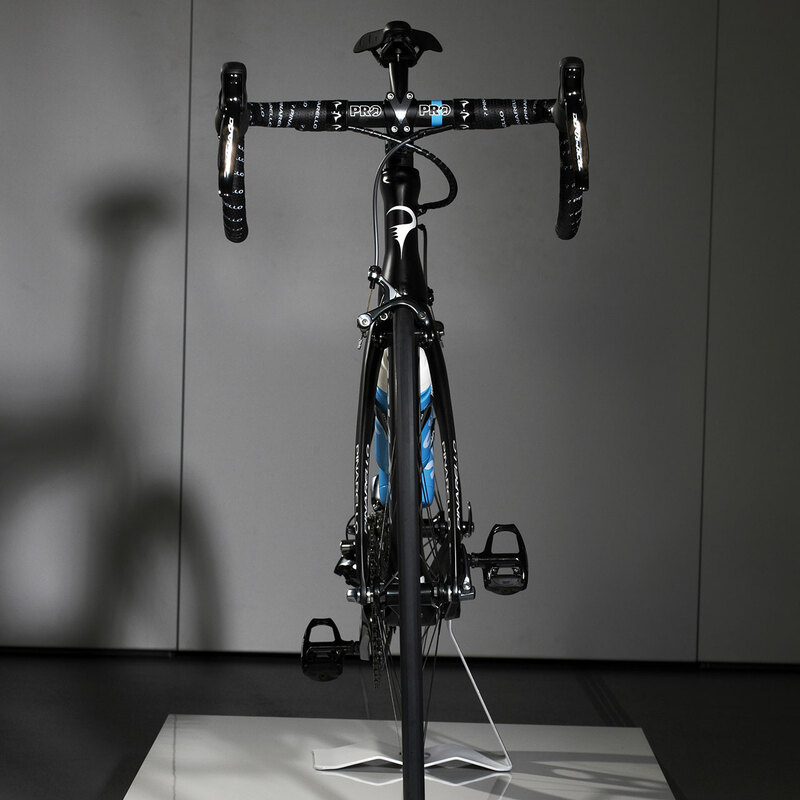 ‘We always look for new technology that improves our bikes’ performance,’ says Fausto Pinarello. ‘It was a pleasure working with Jaguar on the aerodynamics. 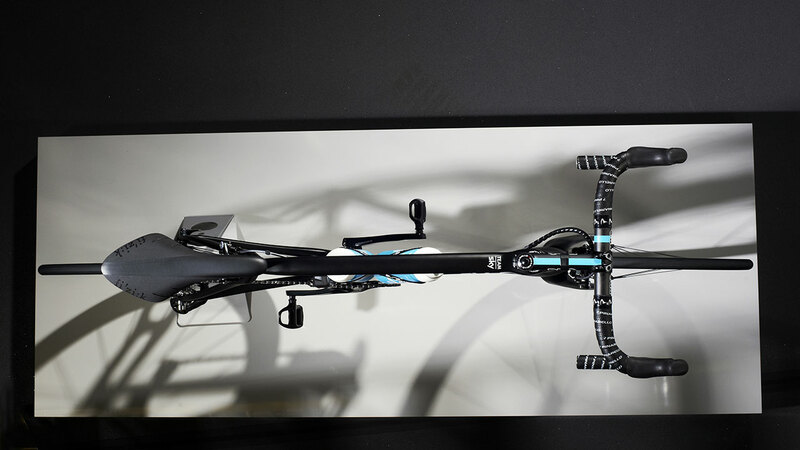 They bought a great deal of cutting-edge aerodynamic expertise which increases Team Sky’s chance of winning the Tour de France and means all Dogma F8 customers will get a superior bicycle.